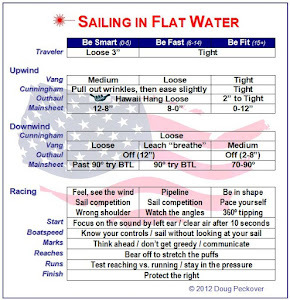 There are even more reasons for a middle-of-the-fleet sailor to try sailing by the lee downwind. 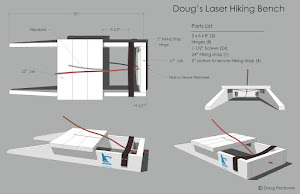 We're allowed one wind indicator on a Laser, and most put theirs in front of the boom. I don't like this for two reasons. It gives false readings because of the wind flowing around the sail and the position of my body being in the way. This has the advantage of making me much more aware of where the wind is coming from and helps me play the shifts going downwind. And there's one more reason. 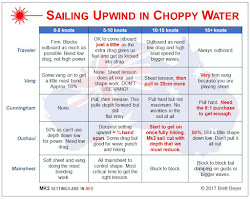 But below a certain wind strength, none of sailing by the lee works and it's best to let the boom out and just head for the bottom mark. But above a certain wind strength, sailing by the lee has the additional benefit of being more stable. You see, when the boom is out and a gust hits, the extra twist at the top of the sail pushes to windward which is why when boats on a run tip in a gust, it’s almost always to windward. Sailing by the lee in a breeze is much safer and reduces the chance of an unscheduled swim. ok I gotta say - the best set of articles I may have ever read about this confusing subject - and as an aspiring mid-packer I'm fired up about sunday!!! Thank you for your kind comments. Good luck on Sunday and let us know how you go. I can't find the 'rule' about the number of wind indicators in my 2013 Handbook. It's supposed to be on p. 41. Was it deleted (by mistake perhaps)? Good question, I have no idea why it's not there. This w/e I switched boats with a friend for one race and it had the the indicator at the front of the boom. It was was amazing how inaccurate it was. Rather than helping, it was a distraction. Page 41 of the 2014 Handbook, left column, mid page. But I don't see anything about being limited to just one. I, too, have a vague recollection of only one indicator being allowed, but I may be remembering back to the '70s! The current rule seems pretty clearly to not limit us to a single wind indicator. The title of the rule even is in the plural, and I read it to allow us to attach as many as we desire. qualities of the hull and mast are not impaired.